Cle de Peau Beaute just launched several items for spring and the new Radiant Lip Glosses ($36 each for 8 ml/.25 oz, made in Japan) caught my eye immediately. There are eight shades of gloss all with a radiant and glowing theme that reflect light with subtle shimmers. It’s been a while since I’ve bought any makeup from Cle de Peau although I regularly restock on their Facial Cotton and love their Loose Powder Puff. The last thing I bought lip-wise was the Radiant Rouge Liquid which I thoroughly enjoyed and based on that fact decided to splurge on all of the new Radiant Lip Glosses that launched for spring. 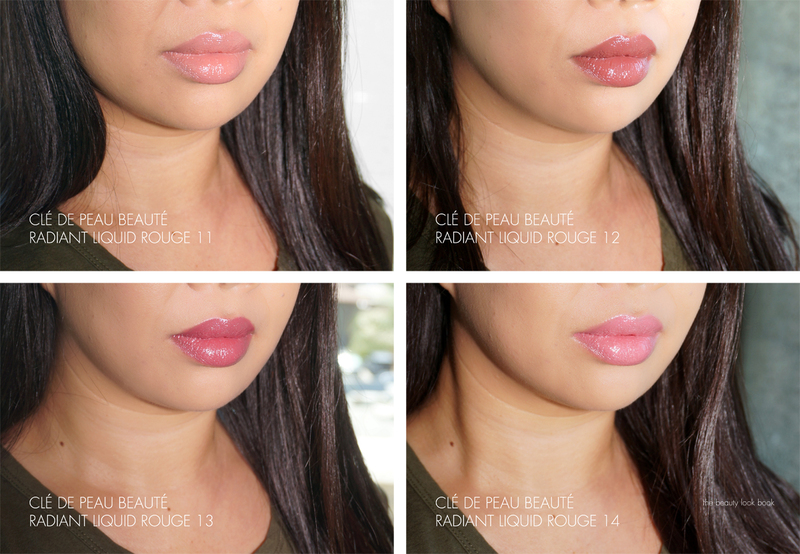 The new Radiant Lip Glosses are cushiony glosses that have a very smooth non-sticky finish. There is a very slight hint of a soft floral scent but it’s a barely there kind of scent so those who prefer scent-free lip products will still be able to wear them. Based on the arm swatches online I expected medium coverage. On me these are sheer to medium, but definitely pull more on the sheer side. Each shade has some degree of reflective shimmer – some are more sparkly than others but every one has a very natural looking sheen. They come with a sponge tip applicator that has a twist. The wand itself is semi flexible so it molds to the curve of the lips. I love the formula in the sense that it feels comfortable and hydrating. No irritation or peeling the next day after use. I do wish the pigment was kicked up a notch as the colors are gorgeous! But since I have pigmented lips 1 through 4 pretty much look the same on me. The closest thing I can think of in terms of formula is the Chanel Rouge Coco Glosses but the Cle de Peau ones are sheerer, more cushiony and not quite as thick. As far as lasting power goes they stay put pretty well but as with any sheer formula it’s not going to last for hours and you’ll need to reapply. I just finally tried one of the Lipsticks and the formula is AMAZING! If you’re looking to splurge and love Cle de Peau Beaute, I’d say maybe buy one or two of the glosses but save your pennies for the Lipstick or Radiant Liquid Rouge. I’m happy with my haul. 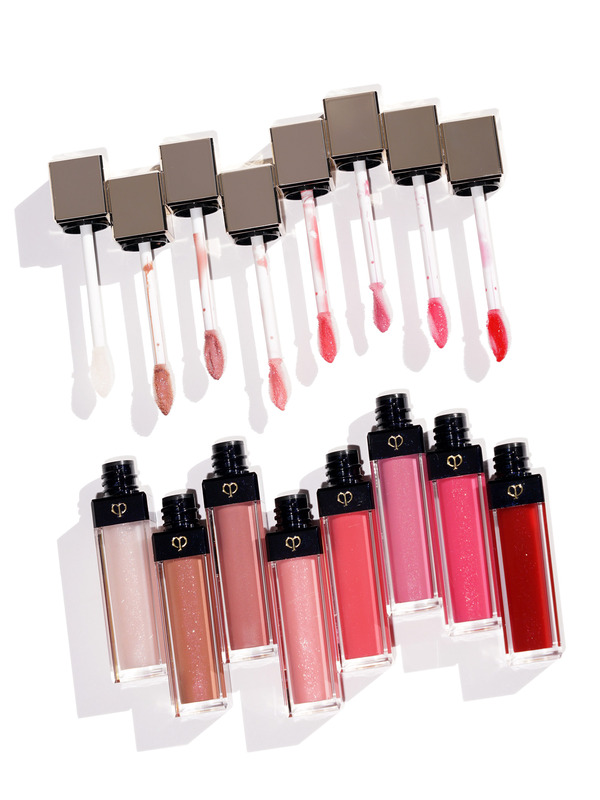 I think the price point is reasonable, especially since these glosses are from Cle de Peau Beaute. As a gloss I don’t think these are must-haves simply because they the pigment level in real life doesn’t quite match the online swatches. Formula-wise though I think these are amazing. They are nourishing without that heavy feel. Lips feel very smooth and the finish is cushiony without any tacky feel. I think these are really nice glosses, if there was more color payoff they’d be 100% perfect to me, but I like the colors in the lineup. I do think I’ll be reaching for these frequently in the upcoming months. However my heart still belongs to the Radiant Liquid Rouge and I’m hoping more shades will be launched in that formula. For now with the new Radiant Lip Gloss, my top picks: Warm Crystal, Star Dust and Dream Stone. 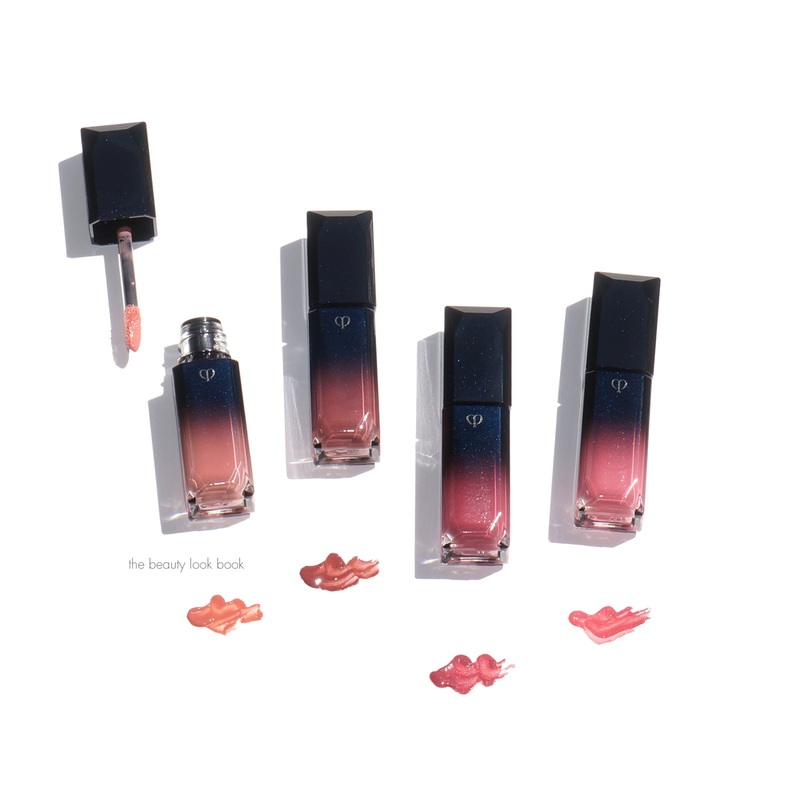 You can find the Cle de Peau Beaute Radiant Lip Gloss at counters now. I bought mine from Neiman Marcus. Also available at Nordstrom, Barneys New York, Bergdorf Goodman, Saks Fifth Avenue and Cle de Peau Beaute. Are any of these on your radar? What’s your current favorite lip gloss formula? One of the things I love about blogging is connecting with readers who are even more passionate about beauty, cosmetics and fragrances than I am. I’ve learned so much from others who have taken time out of their day to write me about their latest discoveries and loves. 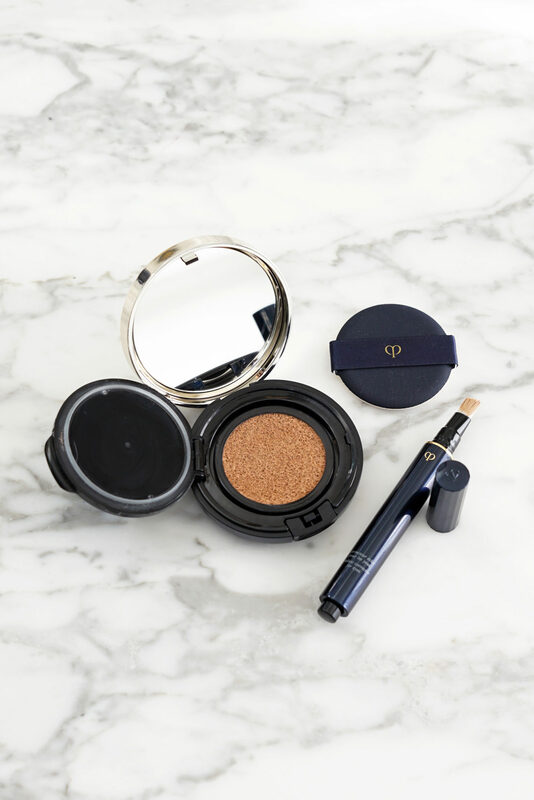 Clé de Peau Beauté is one brand that gets frequently mentioned in my inbox. I’ve avoided most of the items from the brand due to the high price points but after so many raves, I couldn’t help but finally check out the Luminizing Face Enhancers ($95 each for the compact+case, or $55 for just the refills). 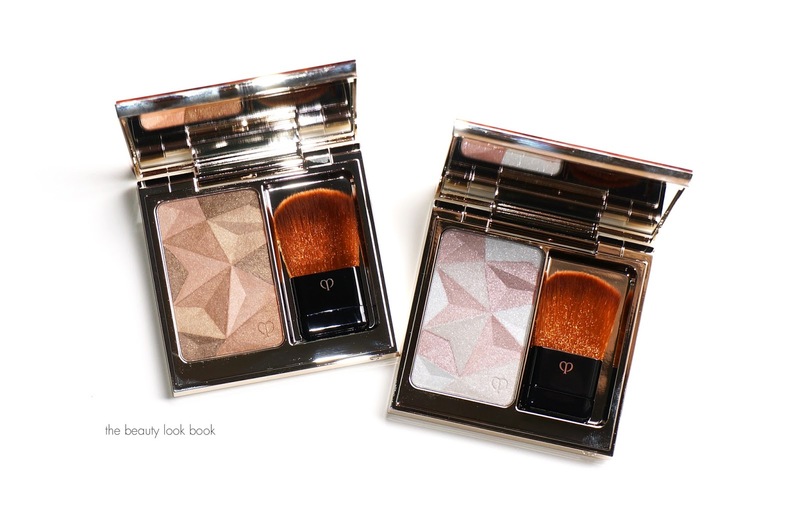 The Luminizing Face Enhancers are powder highlighters that come in a refillable prism-like covered gold mirrored case. There are currently four shades available in a pale white, silvery pink, gold and peachy-bronze. I picked out #13 Sand Beige and #14 Delicate Pink at Neiman Marcus. 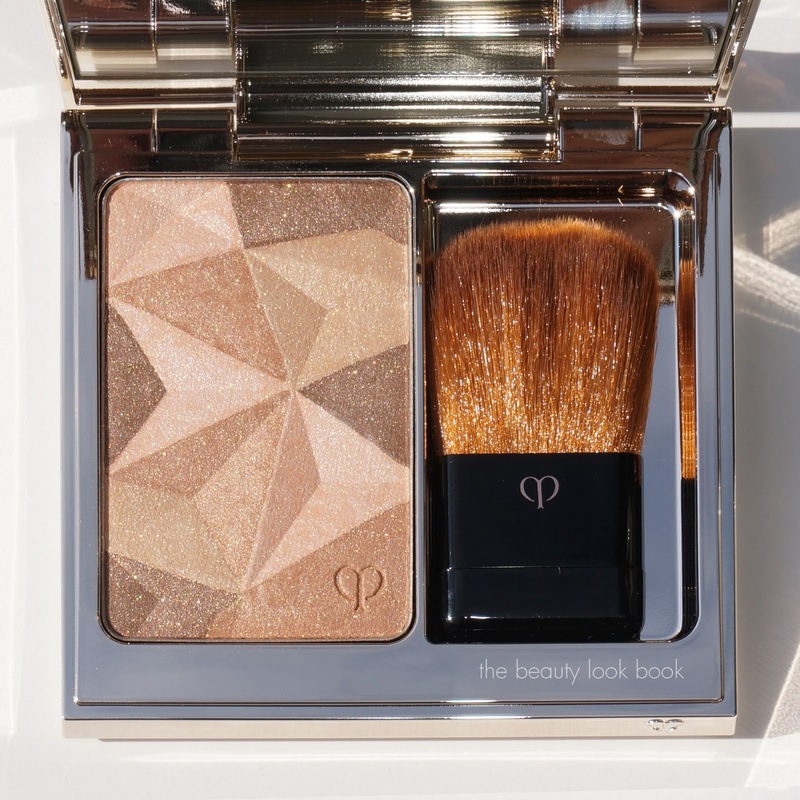 The Luminizing Face Enhancers are finely milled super soft pressed powders each containing multiple shades of shimmer pressed together in a jewel-like pattern. It’s difficult to tell exactly how many different shades there are per compact, but there are at least four different colors pressed together. These come with a sheer veil of glitter overspray (which I’m not fond of) but once you dust it off you get a luminous powder underneath. Once applied on the skin the shimmer is visible but it provides a natural glow. I’ve applied on the cheeks, temples and eyes. These blend in with the skin extremely well. Some powder products can look like they just sit on the skin, but the Clé de Peau Beauté highlighter melds quite well giving a natural look. For me these are too shimmery to apply all over the face, but they are not frosty. I like them as traditional highlighters. 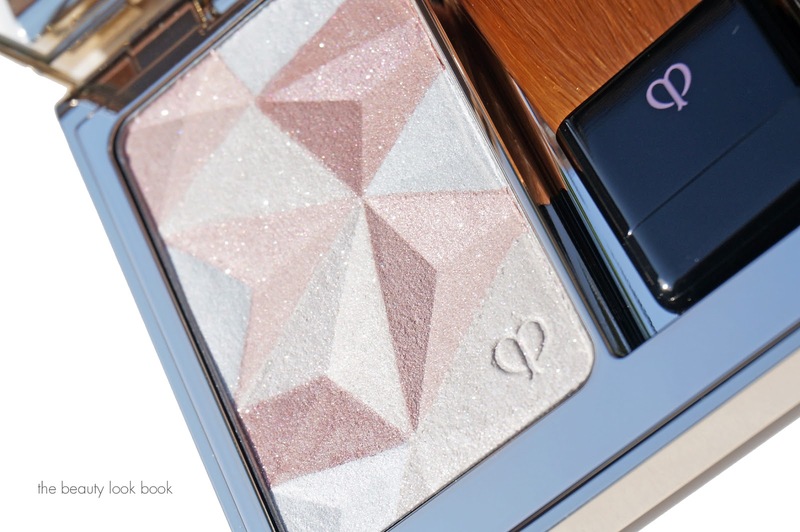 I would say the shimmer factor is light-medium, somewhere in between the shimmer of Hourglass Ambient Lighting Powders in Dim Light and Luminous Light, but with larger shimmer particles infused throughout. #13 Sand Beige is my favorite. It’s the darkest option which might look more like a bronzer on fairer skins (anything lighter than a Chanel B20). 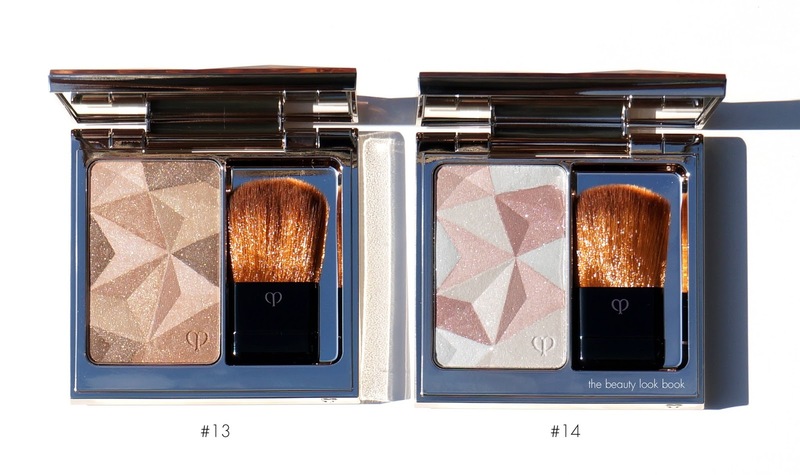 On my medium olive skin the Clé de Peau Beauté #13 is the perfect natural golden honey highlight. It’s similar in color to Chanel Dentelle Precieuse not quite as shimmery as the Chanel (swatch comparisons below). The brush that comes in the compact is quite good, I’ve used it for touch ups, it’s soft and dense and picks up product well. I do wish it was bigger, but for a compact brush, it’s the best I’ve tried. #14 Delicate Pink is a cool-toned silvery pink on me. It’s on the pale side which contrasts with my olive skin. I’ve seen it on fairer skin tones and it makes the entire face glow. For me it’s something I use with a very light hand on the temples, on the nose, under brow bone (applied very softly) and it gives dimension to the face. It’s difficult to capture the luminous shimmer in photographs but this one gives the skin a perfect glow. Swatches below. The flash and light emphasized the shimmer particles, in real life they are more subtle on the face, I swatched these with a heavy hand to show the color and shimmer. When applied normally, the shimmer isn’t quite as pronounced as shown in the detail shot. 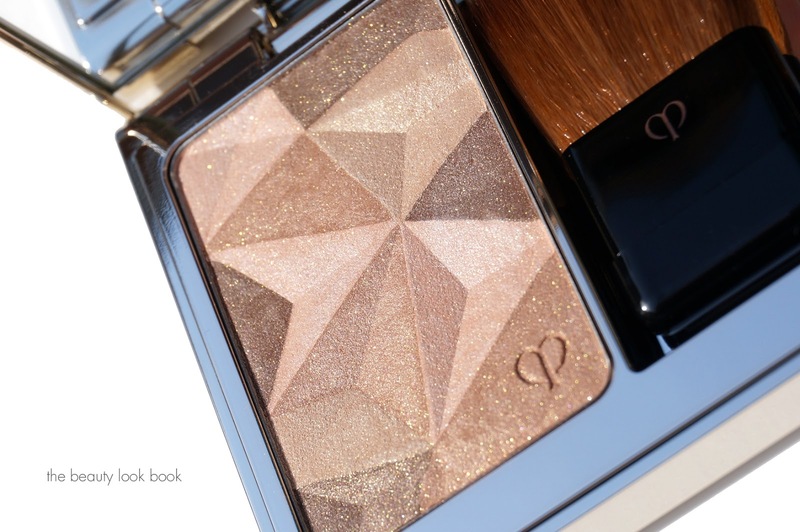 Many have reported these Clé de Peau Beauté Luminizing Face Enhancers to be the best powder highlighters on the market. For me, there are so many different types of highlighters, I think finding the “best one” will depend on what you are looking for. Some highlighters offer intense shimmer or color like Mineralize Skinfinishes from MAC or Shimmer Bricks by Bobbi Brown. Others like Chanel Poudre Douce (discontinued shades like Rosee or Peche Tendre) or Dolce & Gabbana are highlighting powders that are designed to be use over the entire face. Hourglass Ambient Lighting Powders have a wide range of shimmer finishes and textures created for different skin tones to either warm up and bronze the skin, give a candlelit glow-from-within look, or create a diffused glow. There are also different skin types that look better with certain highlighters. There are highlighters that some will find enhance their pores, but on others that same product won’t. Depending on your skin tone, if you’re fair, certain shades will flatter you more than if you are darker. So for me, when someone asks me “what is the best powder highlighter?” My answer would be “it depends.” I’ve been partial to Chanel, Edward Bess and Hourglass for highlighting powders. I’ve also always been a huge fan of MAC Mineralize Skinfinishes (even the frosty ones) for different looks. 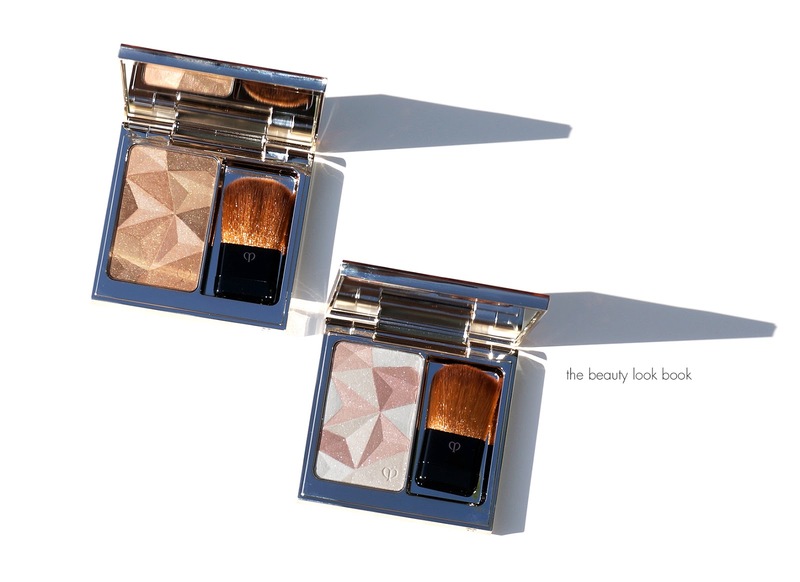 To sum up my thoughts on the Clé de Peau Beauté Luminizing Face Enhancers, I do think they are amazing highlighters. If you’re looking for a natural luminous glow that makes the skin radiate, adds dimension to the face, isn’t frosty and doesn’t emphasize pores, these fit the bill. They do come with a steep price tag which is why I’m reluctant to give a 100% glowing review. The quality of the product and packaging is there and I don’t see any other product on the market that can provide that same glow. The texture is finely milled and it glides onto the skin blending in perfectly. The $55 price tag for the refills is reasonable for me, but the $95 price for the powder + compact is just too much for me no matter how good the product is. That being said, I’m very happy with both and I know I will be using both regularly. These are highlighters you have to try in person to really see how good the glow is. Have you tried Clé de Peau Beauté Luminizing Face Enhancers? What did you think? I bought mine from Neiman Marcus. They are also available at Cle de Peau, Nordstrom, Saks Fifth Avenue, Barneys New York, and Bergdorf Goodman.